" I Am My Beloved, and My Beloved Is Mine " This famous expression of love from the Bible is now offered in a all new and magnificent design. 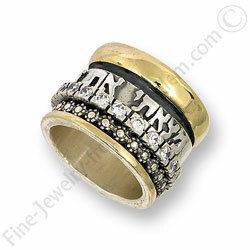 Silver and Gold ring, set with Cubic Zircons. The inner rings are Dynamic, (i.e. spins around the inner ring). Can be made with any Verse of your choice.